It’s one of my favorite films now, but at the time this was first announced, I absolutely hated the idea of revisiting the original series characters. It wasn’t out of any sort of loyalty to the original cast, really, nor out of any sort of deep respect for their final film together, The Undiscovered Country (which contends with The Wrath of Khan for the best film), but more because I was sick of the franchise staying in the past. Other fans were seemingly of the same mind, with viewership so low for the prequel series Star Trek Enterprise that it resulted in the first Star Trek cancellation since the original series, and the abhorrently tacky Next Generation send-off Star Trek Nemesis earning the lowest box office in the series. So why was the studio and director J.J. Abrams, a self-admitted non-fan of the franchise, so keen on moving backward with the new film when stagnation was the series’ biggest problem in the first place? Of course, having now seen the film, I can certainly say that Star Trek is far from stagnant, and it all makes so much sense in hindsight. This was the film that the franchise needed. This wasn’t a film that would simply retell the story of how these characters met like some run of the mill prequel, nor was it a franchise reboot that threw out the old and asked fans to just accept the new story as the new standard from now on, like so many super hero films. Using that old series mainstay, time travel, Abrams & Co. allowed for the original timeline to remain untouched while beginning a completely new one in which they were freed from the burden of meticulously ensuring that their story didn’t violate any previous canon. For all we knew at the time, Chekhov could be dead by the end, only to be reborn and revealed as the smoke monster on Lost one year later. Not that Abrams was dumb enough to do something that silly. He may have been new to the series, but he respected its dignity, and he respected its fans — though that didn’t stop some Trekkies from voicing their distaste for the more youthful, funny, and action-packed direction he took. (Also, those love-’em-or-hate-’em lenseflares.) It was, indeed, a new beginning with a new attitude and new possibilities. The Star Trek of 2009 is arguably “dumber” than many of the other films in the series, created first and foremost to be summer popcorn entertainment than an exploration of the mysterious depths of space and humanity. But you know what? That’s okay by me. If you want your technobabble, there are still black holes and mindmelds and warp fields and such, but it’s all glossed over and streamlined in the name of having more fun while integrating those elements into the fun — Scotty’s line about the Enterprise‘s “ample nacelles” is pretty hilarious. I never felt like the film was was pandering, and yet it may actually be the only film in the series to actually make me open my mouth in a state of awe at some its rather bold choices (none of which will be spoiled here). Some Star Trek films have attempted to explore big questions and failed (The Final Frontier, anyone?) where the more action-packed ones have succeeded in being quality entertainment (First Contact). It’s not as if there’s only one take on Star Trek and that’s it. We even got a comedy in the form of The Voyage Home (“the one with the whales”), and that’s considered one of the better ones! The story of Star Trek is fairly simple, so far as time travel stories go, and the film’s villain, Nero, is as simple as they get: a Romulan blue-collar worker who harbors a misguided resentment for Starfleet and Spock and vows to avenge his homeworld when they failed to save it from a nearby exploding star in the original timeline, an even that leads to him inadvertently going back in time through a space anomaly and taking advantage of the situation to change history. As far as sci-fi goes, Nero’s nothing too special or even particularly engaging, despite Eric Bana’s admirable attempts to instill him with a cocky confidence and an underlying rage. The main attraction here is watching the new takes on the familiar characters come together and fulfill their destinies aboard the USS Enterprise, despite the time travel shenanigans going on. Nero is less a threat to the Federation than he is to the unity of the crew that should have been. This means that a lot of the film’s success hinges upon the effectiveness of the new cast taking on roles from actors who have more or less become synonymous with their characters. While they are unlikely to ever usurp the crowns as the definitive versions, the new cast, with one movie, collectively manages to pay respect to the original cast while being different enough to be refreshing. Anton Yelchin’s exuberant wunderkind Chekhov, Simon Pegg’s humorous and jovial Scotty, and John Cho’s sword-wielding Sulu make strong enough impressions in their supporting roles, though some do get more screen time than others. Chris Pine’s Kirk maintains the self-assured confidence of Shatner’s portrayal, but his Kirk is one who lacks direction thanks to the history-changing event that led to the death of the father who would have been his inspiration. (That opening scene, by the way, is by far one of the most beautiful and tear-inducing moments in all of sci-fi and is a highlight for Michael Giacchino’s fantastic score.) Zachary Quinto’s Spock is similarly overconfident in this timeline, considerably more volatile in temperament and outwardly conflicted by his half-human/half-Vulcan heritage and the contradictions that brings up when emotions are involved. The relationship between these two forms the backbone of the film’s story, as the events of this new timeline has resulted in the two distinct individuals in conflict rather than complementing each other’s strengths and weaknesses. Zoe Saldaña, as Uhura, the sole female cast member, is given the job of playing… well, the girl, but she’s given more to do here than Nichols ever did, her role seemingly informed by those Star Trek episodes where Uhura flirted outwardly with Spock, and it only makes sense that this more emotional Spock would have followed in his father’s footsteps and fallen for a human woman. Karl Urban, rounding out the cast, channels Deforest Kelley’s portrayal of McCoy as possibly the most accurate one in the film, sometimes to the point of almost seeming like a borderline caricature. He’s certainly one of the cast’s highlights, providing lots of fun, cranky humor, and grounds the film as a very relatable, human figure. It’s all too often when something fails or fizzles out in popularity and profitability and the big business men get it in their heads that it’s time to be done with the old and replace it with the new, all the while demanding changes that ignore what made them so successful in the first place. Star Trek is admirable in the fact that it successfully uses the sci-fi genre to actually integrate the “reboot” into the story itself, taking the opportunity to reel in the longtime fans who were curious as to how their favorite characters would be reborn and also attract new fans who will hopefully ensure the longevity of the franchise, people who previously knew Star Trek only as that show set in space starring that one guy who has the ears, that robot guy with the visor or something, and the other guy named Scotty who beams people up. J.J. Abrams’ take on Star Trek is a crowd-pleaser, to be sure, but in this bold new era where nerdy things are popular, for once, us nerds are included in the crowd. Good review CJ. 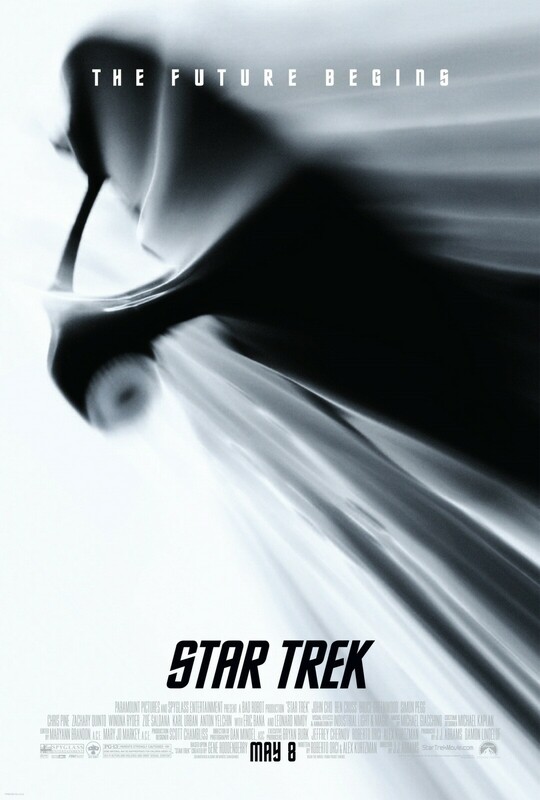 Saw this when it first came out and can honestly not believe how much of a Trekkie it made me. Can’t wait to see what Abrams does with the second one, even if I have been hearing some mixed-feelings about it so far.